Estimated economic loss and casualty information will now be included in earthquake alerts sent out by the U.S. Geological Survey (USGS) following significant earthquakes around the world. The USGS automated system, PAGER (Prompt Assessment of Global Earthquakes for Response), rapidly assesses earthquake impacts by estimating the shaking distribution, the number of people and settlements exposed to severe shaking, and the range of possible fatalities and economic losses. The estimated losses trigger the appropriate color-coded alert, which determines levels of response: no response needed (green); local or regional (yellow), national (orange) or international (red). The Global Earthquake Model initiative has released an online review within the scope of its Socio-Economic Impact module, to obtain feedback from experts, decision-makers and others with an interest in social and economic consequences of earthquakes. The review will be open to all from 15 September - 15 November 2010. Click here to access the review page and submit your comments! 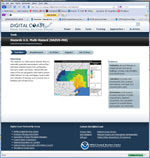 The NOAA Coastal Services Center works with various branches of NOAA and other federal agencies to bring information, services, and technology to the nation's coastal resource managers. The Center is a partner in over 100 ongoing projects geared to site specific coastal issues. The NOAA Coastal Services Center Digital Coast provides the tools, training, and information needed to turn these data into the information most needed by coastal resource management professionals. A recent Red Cross survey, Social Media in Disasters and Emergencies, reports that more people are now use social media tools to report emergencies or call for help, and they expect government response agencies to be actively engaged in using the technology, too. 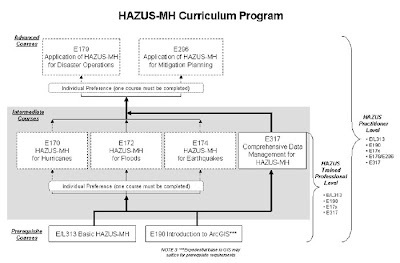 EMI has published the schedule of courses for 2011-2012 at the Emergency Management Institute, including the HAZUS-MH curriculum. California has had a long running program requiring hospitals to seismically upgrade so that they can survive the inevitable earthquake. The state has prepared a list of vulnerable hospital buildings, based on construction, that were required to be upgraded/replaced. Starting in 2004 California began using HAZUS-MH to let hospitals determine a specific building’s danger of collapse ... this allowed the state and hospitals to narrow in and allow people to put the focus on the buildings most at-risk. The recent Building Science Newsletter from NIBS provides some insight into the developing HAZUS Coastal Surge Model. The HAZUS hurricane wind field model will be coupled with SWAN, an ocean and near shore wave model, and the National Oceanic and Atmospheric Administration’s (NOAA) SLOSH model. The HAZUS-MH wind-only and flood-only loss estimates will be combined into an overall estimate of combined coastal wind and flood losses for a single hurricane event while avoiding double counting of damages. Work remains on the Coastal Surge Model for overland waves, flood-only damage functions in V zones, and damage/loss matrices for building classes other than residential. Data from either Hurricane Ivan or Hurricane Gustav will be used to create a spreadsheet of prototype Coastal Surge Model loss results that will be validated with actual losses to be obtained from FEMA. 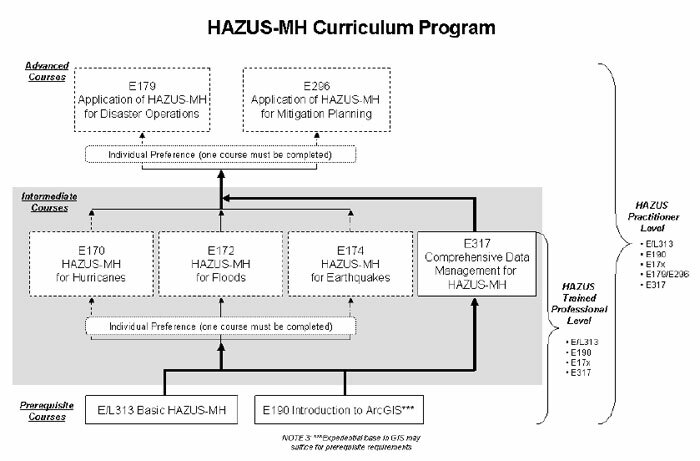 It is anticipated that the Coastal Surge Model will be incorporated into HAZUS-MH MR6, tentatively scheduled to be released in late winter 2011. Check out the National Weather Service National Hurricane Center web site for the latest info on Hurricane Earl. WARNINGS and WATCHES for the U.S. east coast have been issued.